We are embarking on a new journey! PHE and #Wecommunities are exploring new ways of learning and professionally developing using social media. 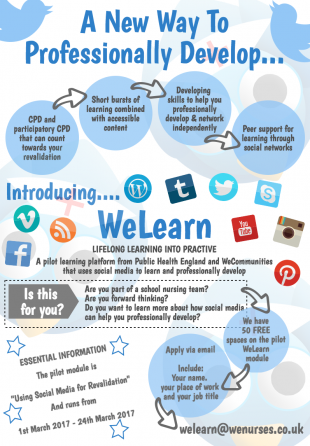 So please welcome…… 'WeLearn - Lifelong learning into practice’. So what’s new? Well this is not a traditional eLearning module that assumes you can apply achieved shared skills. WeLearn shares and teaches new skills and takes you on your personal and bespoke journey, helping you to apply and reflect through guided real, life application, so really supporting delivering Revalidation applicable outputs. The pilot aims to give people the skills and confidence they need to use social media to inform their work, to use social media as part of their work and to use social media to share and celebrate their work. The pilot module will run from 1st March to 24th March, be focussed on school nurses (expanding to other #WeCommunities later), and will be entirely online and use social media to share information and for peer support. Learning is a life long journey, it’s bespoke and we all take different things from it. Revalidation provides an opportunity to reflect on our learning and our practice, the two are intrinsically linked both adding value to the other. We all learn and share our reflections from practice in different ways, however social media and the use of twitter for many is proving to be their vehicle for their journey. Looking back, perhaps twitter when it first hit our radar was fun, new and maybe a little distractional therapy after a hard day? How things change - the maturity of the whole concept means the reach and impact is being taken much more seriously. Driving forces within the professional arena such as @wenurses have supported and indeed nurtured the change of mind set. It is always a pleasure to have creative time with Teresa and Nick, bouncing ideas and the ‘what ifs’ is liberating – but never more so than when an idea comes together! So the idea has moved in to a plan and we are ready to start the pilot phase. The pilot initially will focus on school nurses but the potential for other communities is always being considered! So we are looking for 50 volunteers to pilot the approach – are you interested? Then do please get in touch via welearn@wenurses.co.uk ! We will be feeding back on the pilot as it unfolds so you can be part of the journey and prepared to hop on board!